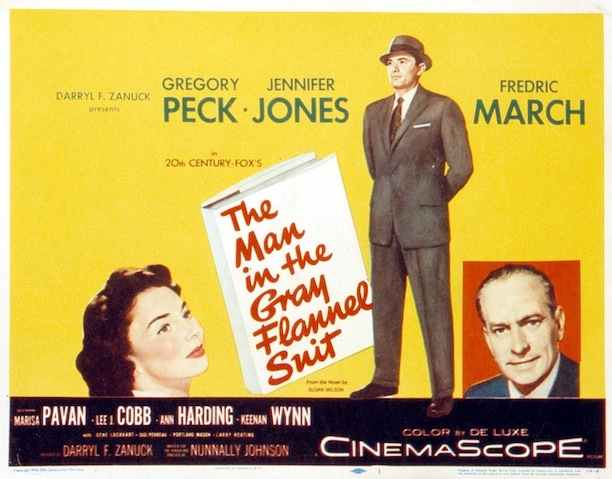 Advertisement for the film The Man in the Gray Flannel Suit starring Gregory Peck and Jennifer Jones. On May 8, 1920, American author Sloan Wilson was born in Norwalk, Connecticut. Readers know Wilson best for his 1955 book The Man in the Gray Flannel Suit. The novel, set in Westport, Connecticut, examines the life of a returning World War II veteran in post-war suburbia and his subsequent angst-ridden struggle to maintain his family’s upper-middle-class lifestyle. Many consider the book iconic in its encapsulation of the cultural tensions of 1950s America—collectivism versus individualism. Married at 18, Sloan graduated Harvard University in 1942 and immediately signed on to the Coast Guard during World War II, serving in both the North Atlantic and the South Pacific. At the end of the war he returned home to follow his dream of establishing a writing career while working as a cub reporter for the Rhode Island Bulletin and Journal. He eventually moved on to Time magazine in New York where he became connected to the National Citizens Commission for the Public Schools, serving on their staff for three years in Washington, DC. Wilson then pursued a career as an assistant professor of English at the University of Buffalo. He subsequently left academia to work as the Director of the 1955 White House Conference on Education, the editor of Parents magazine and eventually the education editor of the New York Herald-Tribune. Wilson used his position at the Herald-Tribune to address topics he felt deeply passionate about, calling for financial support of public education and examining the ramifications of school segregation and integration. Sloan Wilson wrote poetry and fiction throughout much of his life, but it was the success of The Man in Gray Flannel Suit in 1955, and then the hit of the Hollywood movie starring Gregory Peck and Jennifer Jones in 1956, that helped him become a full-time novelist. The Man in the Gray Flannel Suit became part of the American lexicon in its representation of the soulless corporate man. Wilson, Sloan. The Man in the Gray Flannel Suit. New York, NY: Simon and Schuster, 1955. Wilson, Sloan. What Shall We Wear to This Party? The Man in the Gray Flannel Suit Twenty Years Before & After. New York, NY: Arbor House, 1976. Saxon, Wolfgang. “Sloan Wilson, of ‘The Man in the Gray Flannel Suit,’ Dies at 83.” The New York Times, May 27, 2003, sec. Obituaries. Link. Wyne, Zaahira. “Sloan Wilson, the Legendary Author Behind ‘The Man in the Gray Flannel Suit’ Speaks Out to the Next Generation.” The Free Lance-Star. July 12, 2001, Vol. 117 No. 193 edition. Link.